Boxcutters, Jigger, Citrus Juicer, Stirrer (long Spoon), Saucers, Rocks Glass, Cup. 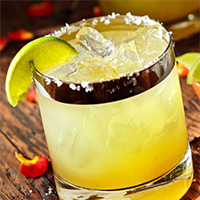 With the Wedge Lime and Salt created the Rim a Rock Glass (Old-Fashioned). Add all Ingredients to a Shaker except Grand Marnier. Add ice. Shake well until chilled. Strain over fresh ice.